China is expected to lead the global refinery industry in terms of capex as well as crude distillation unit (CDU) capacity additions during the outlook period 2019–2023, according to GlobalData, a leading data and analytics company. The company’s report: ‘H1 2019 Global Capacity and Capital Expenditure Outlook for Refineries – China Leads Global Refinery Capex and Capacity Additions’ reveals that China is expected to add 3,121 thousand barrels per day (mbd) of CDU capacity, the highest among all the countries, through 10 new-build refineries. Nigeria follows next with 2,030 mbd of CDU capacity addition through 31 refineries by 2023. Among regions, Asia is expected to add the highest CDU capacity of 6,801 mbd in 2023. The region is also expected to spend US$216.7bn on new-build (planned and announced) refineries during the outlook period. GlobalData identifies Africa as the second highest among the regions in terms of CDU capacity additions. Within the region, 12 countries are expected to add 4,074 mbd of CDU capacity in 2023. Nigeria, Angola and South Africa are expected to be the major contributors with capacity additions of 2,030 mbd, 798 mbd and 400 mbd, respectively. The region plans to spend around US$121bn on the new-build refineries between 2019 and 2023. The Middle East is the third highest region in terms of CDU capacity additions. The region is expected to add about 3,378 mbd in 2023. Within the region, Iraq has the highest capacity of around 1,190 mbd in 2023. The country is expected to spend around US$41.2bn during the forecast period on new-build refineries. 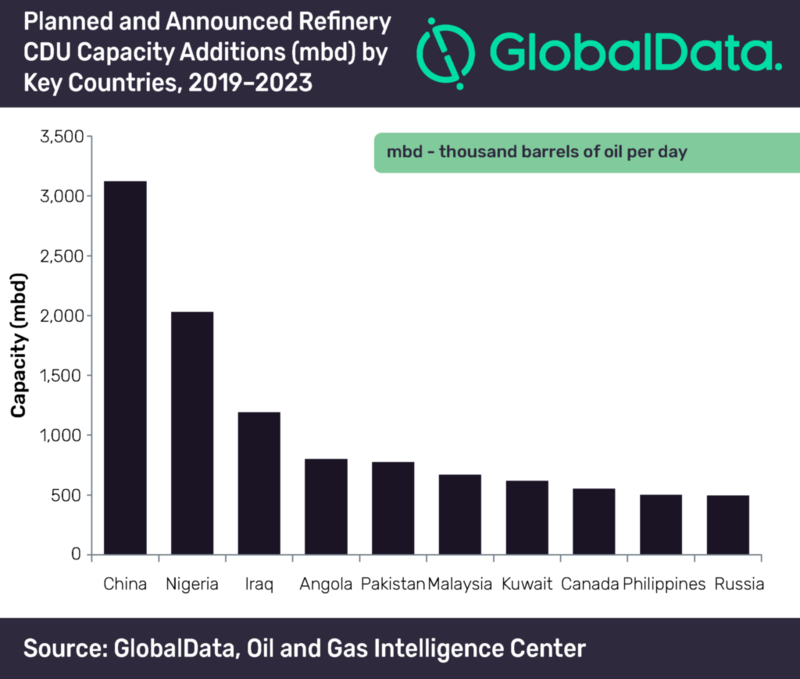 Among the upcoming refineries, the Dayushan Island refinery in China, the Lagos I refinery in Nigeria, and the Al-Zour refinery in Kuwait are the top three upcoming refineries globally in terms of CDU capacity by 2023. The Dayushan Island refinery will have capacity of 800 mbd, followed by Lagos I with 650 mbd and Al-Zour with 615 mbd.